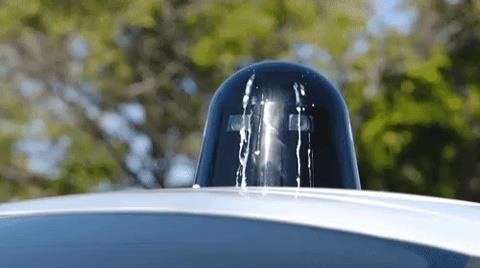 Waymo has done a lot of things over the course of their driverless journey, but their solution to little birdies pooping all over a self-driving car's LiDAR system is definitely our favorite. The sensors on Waymo's autonomous vehicles, as well as any other self-driving car brand, can be obstructed when nature calls, making it difficult for the vehicle to navigate its surroundings. It's also entirely possible that too many bird droppings on the sensors could even cause disengagements in some situations. Forget the LiDAR that navigates traffic lights, people, and pavement. All eyes are on these teeny, tiny wiper blades! According to Waymo, they're not just for bird crap either, but for rain, dirt, and anything else that could obstruct the LiDAR's view. Wipers were added to clean the spinning LiDAR sensor on top of a Waymo car, a surprisingly simple innovation for a very common problem. A driver could easily wipe away the doo-doo, but the end game is for these vehicles to be completely driverless with sensor technology. Which means they have to clean up their own mess. The fact Waymo has reached a bird-poo eradication stage speaks volumes about how far they've come. It also says a lot about First World problems ,but that's a whole other post.